Is Indongo the Man to Conquer Crawford? By Donavan Leonard: When WBA and IBF junior welterweight champion Julius “The Blue Machine” Indongo (22-0, 11 KOs) takes on fellow unbeaten WBC and WBO champion Terence “Bud” Crawford (31-0, 22 KOs) on Saturday August 19th in Lincoln, Nebraska, the evening promises to answer questions about both fighters. The extremely rare event of a full unification bout is a complementary footnote, as although a belt does not make the fighter, it certainly makes the fighter more marketable. What is more important is that two of the top three fighters in the division, according to Ring Magazine, will be facing off for supremacy. It can be justifiably argued that these are the top two, as Viktor Postol has not fought in over a year since Crawford easily bested the man who was thought to offer him a true challenge. Crawford has earned his way into the conversation as one of the top fighter’s pound-for-pound, with overwhelming victories over quality opposition. His quickness of hand and foot, ability to change from the orthodox to the southpaw stance smoothly and effectively, his ring IQ, and his “how-dare-you-share-the-ring-with-me” attitude make him enjoyable to view for both the sweetness and the savagery of his science. To date, the victory over Postol has been the biggest feather in his cap, but a convincing win over Indongo would trump that feat and give him more ammunition when discussing the mythical title of best fighter, pound-for-pound. Indongo, as his road victories over Eduard Troyanovsky (KO 1) and Ricky Burns (UD 12) display, does not appear to be an easy task. The vocal, hostile crowd in Lincoln will not intimidate him, just as bouts in Moscow, Russia and Glasgow, Scotland did not impact his performance. In fact, the win over Burns was every bit as easy for him as it was for Crawford in his match with Burns in March 2014. Indongo will no doubt come in confident in his abilities and undeterred by the environment. Indongo does not feel as if he is fodder–he feels he belongs in the ring with Crawford. 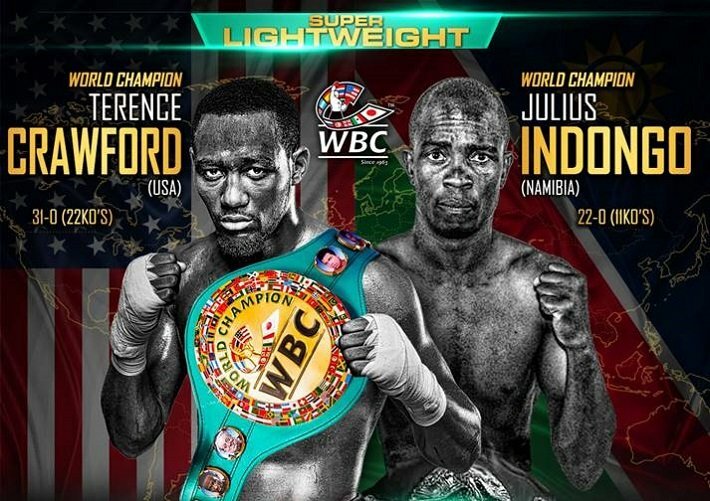 As for physical attributes, Indongo is taller than Crawford (5’10” vs 5’8″), and he has a longer reach (71″ vs 70″). Physical advantages do not necessarily translate into wins, as both John Molina Jr (5’10”, 71″) and Postol (5′ 11″, 74″) both had the edge over Crawford in these departments. There is little video footage of Indongo (forty seconds vs Troyanovsky and twelve rounds vs Burns, along with a few other clips), but Indongo does not fight like either of these previous Crawford victims. Molina and Postol do not possess the athleticism or speed of hand and foot that Indongo appears to have. Indongo is comfortable fighting on his toes as opposed to the methodical walk-forward approach that Molina and Postol attempted against “Bud”. He is good at dictating distance between his opponent and himself, which allows him to fire his shots when he is ready, and the ability to step out of range if the opponent tries to lead. If Crawford is impatient or sloppy (traits that he rarely displays), he could be caught. Although his record does not indicate that his a heavy-hitter, Indongo has knocked out three of his last four opponents. The only one to last the distance was Burns, who has never been knocked out. Indongo is left handed. Crawford’s last opponent, Felix Diaz, was also a southpaw, but a much shorter opponent (5’5″). There is no comparison between their fighting styles. One ploy that Crawford has used effectively is switching to the southpaw stance, but against a taller lefty, it will most likely provide more openings for Indongo than it will for Crawford. History has shown that tall left-handers can be difficult opponents for even the highest class of fighters. Antonio Tarver, Derrick Harding, and Lou Del Valle gave the great Roy Jones Jr difficulty. Austin Trout perplexed Miguel Cotto. Winky Wright dominated Shane Mosley. Paul Williams was a tough out for any welterweight when he was in his prime. Is Indongo worthy of wearing two belts, a dangerous, tall southpaw with fight-changing power in his fists, or is he a fighter who happened to be in the right place at the right time, fighting the right opponents to collect the trinkets? Is he Crawford’s most dangerous opponent, or merely the most decorated? Can he take a punch? Does he have world-class power? For a fighter in his position, it is odd to have so many unknowns. Can Crawford put on another amazing performance against a different type of fighter? Will he be able to close the gap as easily as he did against Postol, or will he be caught in no-man’s-land by Indongo’s footwork? Can he batter his opponent and close the show like he did against Diaz, or will he merely be content to get the victory as he was against Postol? Crawford deserves the accolades he has thus far received, but his bout Saturday is by no means a walkover. Indongo is a live opponent and will pose the question of “who is the best junior welterweight?” Saturday night we will find out. Boxing » Terence Crawford » Is Indongo the Man to Conquer Crawford?